White toy poodle puppy, male - born on 30 November 2018. Toypudel Welpe, Rüde in weiß, ist am 30. November 2018. geboren. The parents are prcd-PRA "A", pat lux free, 0/0. White toy poodle puppy, male - born on 30 September 2018. Toypudel Welpe, Rüde in weiß, ist am 30. September 2018. geboren. 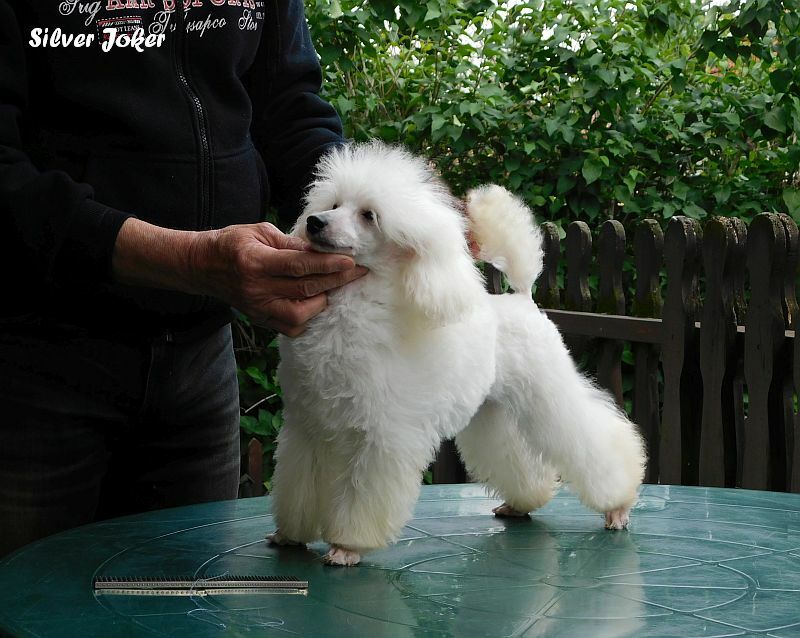 White toy poodle, male. We can give the young male as a lovable companion. The parents are OPTIGEN A, prcd-PRA: Normal, pat lux free, 0/0. White toy poodle male is available for loving family. Toypudel Rüde in weiß ist in liebevolle Hände abzugeben. 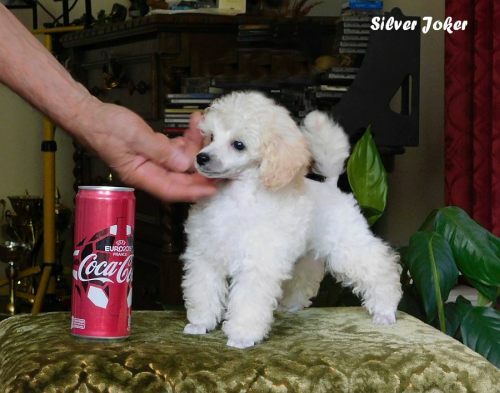 Quality silver and white toy poodle puppies. Zur Zeit Toypudel Welpen in silber und weiß. Toy und Zwergpudelzucht in weiß und silber. Pudelwelpen sind in liebevolle Hände abzugeben. Tiny Toy Poodle Puppy in silver. international champions and a lot of them are champions. und zahlreiche Championpudel stolz sein. FCI International Judge Group 9. FCI Internationaler Richter, Gruppe IX. Silber Toy und Zwergpudel Welpen - Pudelwelpen. Wir züchten Silberpudel, silber und weiss Toypudel und silber Zwergpudel. Zwergpudelzucht silber - grau, Silberpudel zwerg & toy. Dem Alter entsprechend sind unsere Pudel liebevoll sozialisiert und gepflegt. Wir haben Pudel in silber (grau) und weiß . Toypudelzucht - Zwergpudelzucht in silber. Verantwortungsbewußt gezüchtete Toypudelwelpen und Zwergpudelwelpen. Pudelwelpen sind in liebevolle, verantwortungsbewußte Hände abzugeben. Pudelzucht - Toypudel und Zwergpudel in silber. Silver Toy and Dwarf Poodle puppy - puppies. Caniches nains et toys gris. Les adultes participent régulièrement aux expositions canines de beautés. 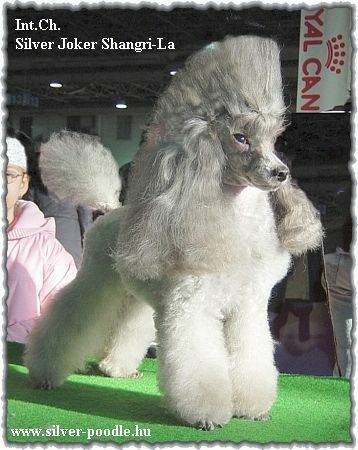 We breed silver toy poodles and silver dwarf poodles. Occasionally we have silver (grey) toy poodle puppies and silver dwarf poodle puppies. We want our silver toy poodle puppies to be placed in loving and caring homes. Occasionally we have silver dwarf poodle puppies. min poodle puppies - min poodle puppy. Silver Toy Poodle for stud. Er steht ausgewerteten Hündinnen zum Decken bereit. Top quality puppies with excellent bloodlines available. Our puppies have a pedigree registered by FCI. We are certified FCI breeder. FCI Internationaler Richter, Gruppe 9. Occasionally we have white toy poodle puppies. We want our white toy poodle puppies to be placed in loving and caring homes.